- The first Chick-fil-A fast food restaurant opened in a mall in south Atlanta in 1967. The first standalone Chick-fil-A opened in 1986. 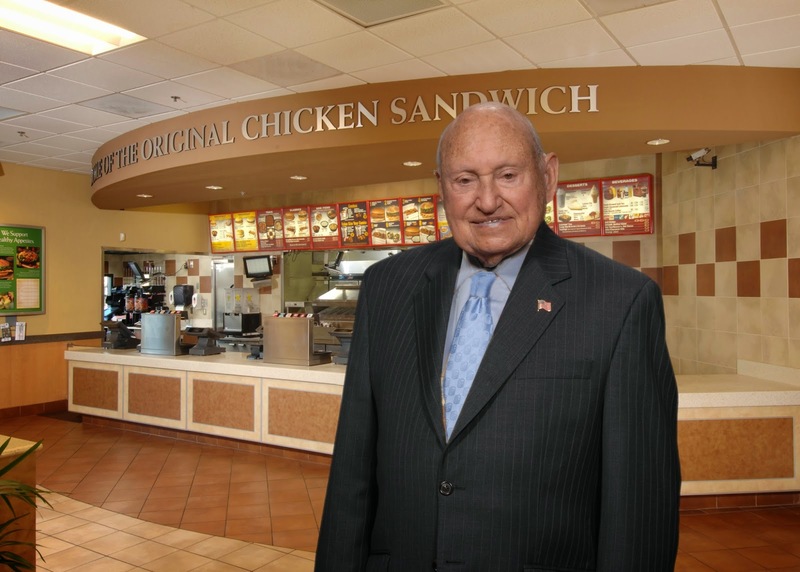 - Truett Cathy made the decision early on never to open his Chick-fil-A restaurants on Sundays. Scoffers said that his decision to close on traditionally one of the busiest days of the week for a fast food restaurant meant that his chain would never survive. His restaurant has not only survived, but thrived. Chick-fil-A is currently located in 38 states in the U.S., and is still growing. Cathy's reasons for closing on Sundays were stated thusly in this press release: "Cathy believes that being closed on Sunday says two important things to people: One, that there must be something special about the way Chick-fil-A people view their spiritual life and, two, that there must be something special about how Chick-fil-A feels about its people. Cathy believes that by giving employees Sunday off as a day for family, worship, fellowship or rest, the company attracts quality people." - Chick-fil-A has a few specialty restaurants that bear the Chick-fil-A name, but which have more menu offerings than the traditional Chick-fil-A's. - One of these Chick-fil-A specialty restaurants is called the Dwarf House. There are several Dwarf House Chick-fil-As located in Atlanta, and these offer a frozen lemonade drink (which my sons love), in addition to the normal Chick-fil-A items. - There is a Hawaiian-themed Chick-fil-A in Fayetteville, GA (called "Truett's Luau," because Cathy was apparently fond of Hawaii.....hey, who isn't?). One of the items served is a fish sandwich, which the menu describes this way: "Mahi Mahi dusted with Luau seasoning, grilled and dressed with a savory Asian slaw and a side of avocado dressing, served atop a multigrain bun." 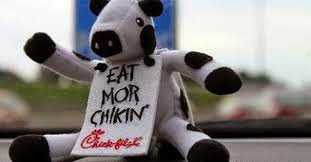 - The "Eat Mor Chikin" ad campaign used by Chick-fil-A is one of the most memorable and longest-running ad campaigns in advertising history. The campaign was created in 1995 by The Richards Group, an advertising agency based in Dallas, TX. - Truett Cathy and Chick-fil-A have been targeted by gay activist groups who do not like Cathy's stand on marriage, which is that marriage was created by God as an institution that should be between one man and one woman. - Sherwood Pictures, a Christian company in Albany, GA that produces films with a strong Christian message, has featured Chick-fil-A in several of their films, including this scene below from their film Courageous . Here's hoping that Cathy's children (who now run the Chick-fil-A business), will continue to uphold the same Biblical principles that their father did, including openly supporting the Biblical definition of marriage. In the meantime, enjoy one of our favorite skits by Tim Hawkins as an homage to the addictive properties of Chick-fil-A. I think I'll treat myself and the boys to some waffle fries and lemonade today after school.